"[I]f the Georgia race had taken place in another country—say, the Republic of Georgia—U.S. media and the U.S. State Department would not have hesitated to question its legitimacy..." Kemp purged/challenged ~700k registrations. Current margin is ~75k. "If the Georgia race had taken place in another country—say, the Republic of Georgia—U.S. media and the U.S. State Department would not have hesitated to question its legitimacy." This is dishonest or mis-informed. The state doesn't shutter polling places, Brian Kemp had nothing to do with it "The state shut down 214 polling places, the bulk of them in minority and poor neighborhoods." There is no one better suited to analyze the political thievery at work in Georgia than @ProfCAnderson, and she makes it plain here. I agree that U.S. press and government seem to get most outraged when elections are stolen elsewhere. That is stupefying. READ @ProfCAnderson: "Under Kemp, Georgia purged more than 1.5 million voters from the rolls, eliminating 10.6 percent of voters from the state’s registered electorate from 2016 to 2018 alone. The state shut down 214 polling places..."
@ProfCAnderson piece in the @TheAtlantic on Brian Kemp's asterik "victory". "if the Georgia race had taken place in another country...U.S. media and the U.S. State Department would not have hesitated to question its legitimacy, if for no other reason than Kemp’s dual roles as candidate and election overseer"
"If the governor’s race had taken place in another country, the State Department would have questioned its legitimacy." 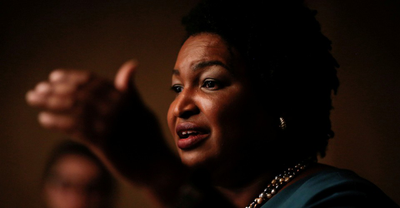 "Abrams didn’t have to fight just an electoral campaign; she had to fight a civil-rights campaign against the forces of voter suppression." "if the Georgia race had taken place in another country—say, the Republic of Georgia—U.S. media and the U.S. State Department would not have hesitated to question its legitimacy"
If the Georgia governor’s race had taken place in another country, the State Department would have questioned its legitimacy. Along with others I fear that this will be the model for minority governance in America - neo-Jim-Crew (although it's related to the phenomenon described as new-Jim-Crow! ), more or less blatant anti-democratic criminality propped up by racist apologism.